I happen to love Brussels Sprouts. I love going into the store and seeing the stalks of Brussels Sprouts. (and no we do not even include bacon with them). I am still working on my daughter! BUT my guest LOVE this salad! This year I will be making Joe his favorite variety of Brussels Sprouts, but I will also be adding a salad to the menu. My friend made this for me a few months ago and seriously since then, I eat it just about every day. 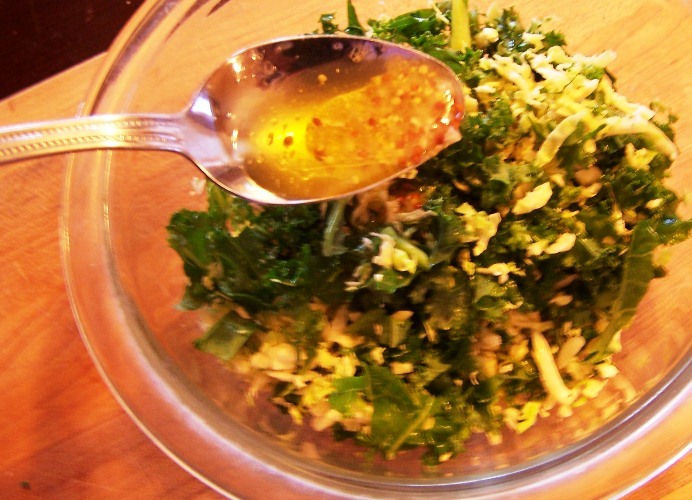 I love the healthful qualities of the Brussels Sprouts and Kale, and the lemony dressing just makes the salad, well, to me perfect! This original salad is from Epicurious. Most of my adjustments are made to accommodate ingredients I typically have on hand. 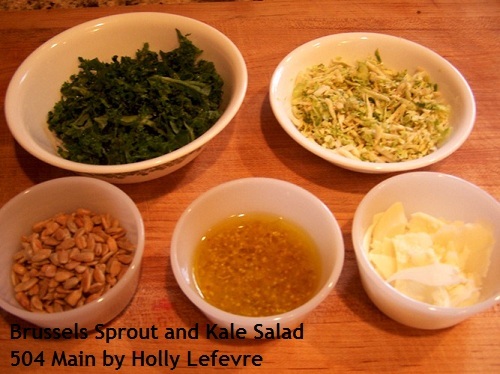 I also happen to like the Brussels Sprout shredded (with my food processor) an the kale thinly sliced as well. Makes a Single (Large) Serving or 2 Regular (side) Servings. (Just multiple the ingredients as necessary for your group). Since I eat this as a meal, the serving is large and probably equals about 2 regular servings. Kale (thinly sliced) about 2 cups (5 large leaves). 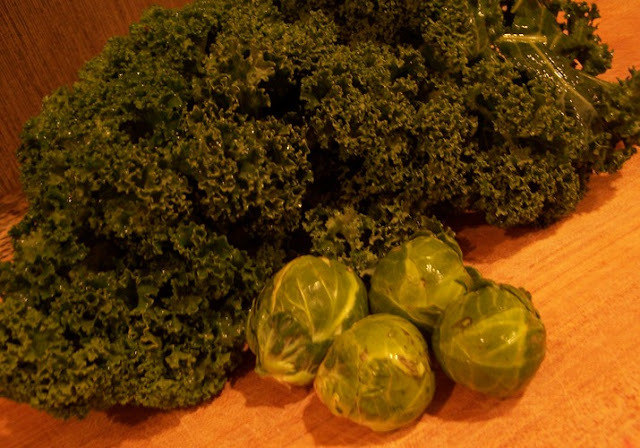 It really depends on the size of your kale and ultimately what ratio of kale to Brussels Sprouts you prefer. When I make the dressing, I make enough for about 4 servings and store it in a jar. 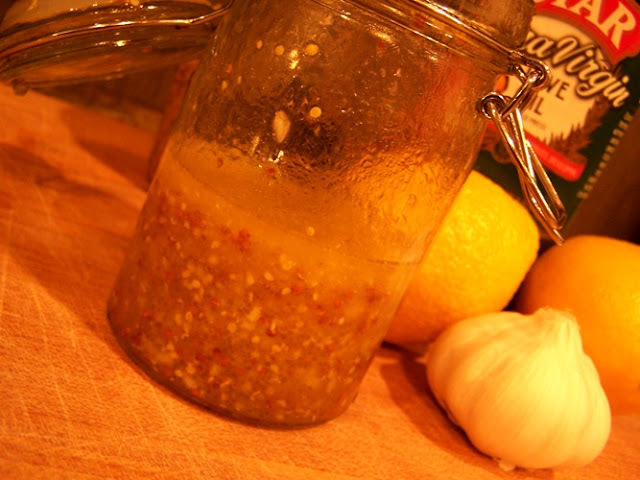 As I start to run low, I check the mustard and garlic levels, and if they are still fine, I add juice and olive oil. I have sliced the kale and Brussels Sprouts with a sharp knife and it tastes just fine. BUT I have found I much prefer the salad when I use my food processor. Normally I do not like the ends of the Brussels Sprouts, but when I use the food processor, they get chopped so fine, Id not notice a difference. First, wash and dry the Brussels Sprouts. Fit my food processor with the chopping/grating blade and lock the bowl and top into place. Place my 6 Brussels Sprouts into the chute, turn on the machine and press with the pusher. NOTE: I often do enough sprouts to make a few salads and store them in an air tight container. 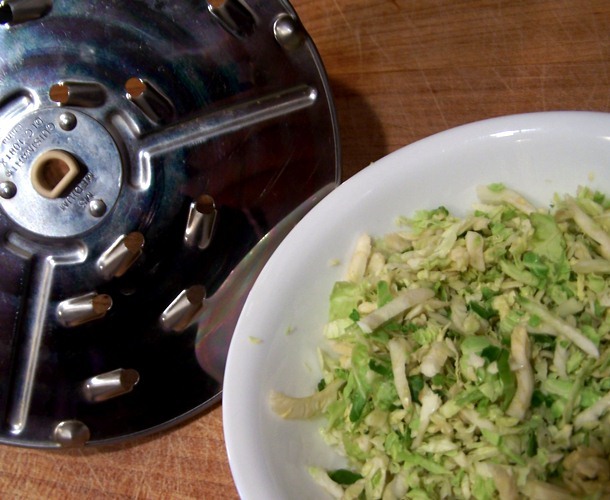 Remove the chopping/grating blade and outfit the food processor with the slicing blade. 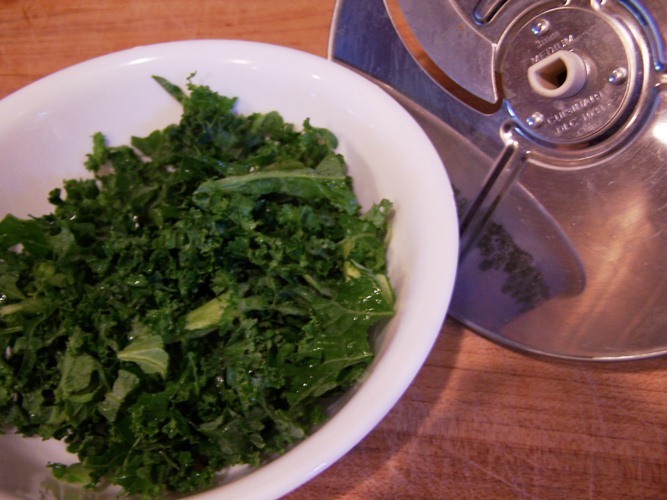 Next, I place my leaves of kale in a salad spinner (or you can wash the leaves individually). Once dry, I put a few leaves into the chute at a time and slice my kale. NOTE: Just as with the Brussels Sprouts, I often slice more Kale and save it in an air tight container. 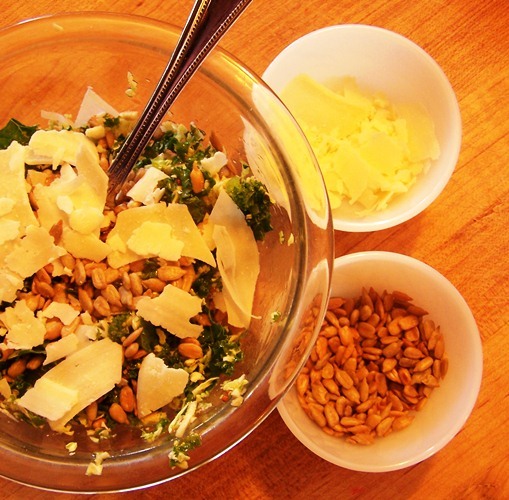 Mix these two elements together in a large bowl. Juice the two lemons. First roll each lemon firmly on the counter to "release" the juice. I juice mine over a measuring cup with a strainer to keep any seeds from getting in the mix. Place the lid on the jar and give it a really good shake! NOTE: As per your personal taste, adjust the oil to lemon juice mixture, as well as the garlic and mustard ratio until you get the taste you prefer. kale and sprout mixture first, and toss really well. 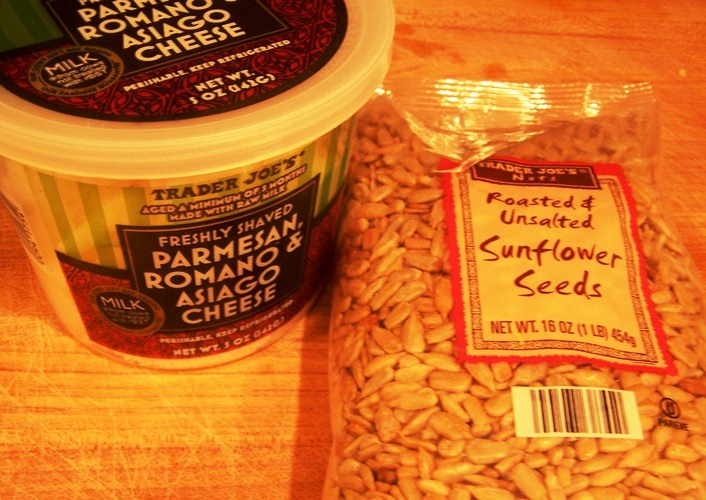 Add the sunflower seeds and cheese, toss again! And eat! won over many non-Brussels Sprout/Kale people! That looks delicious, Holly but I've got to admit I've never tried Brussels sprouts! I don't have anything against them but no one has ever served them to me and I've never thought of buying them to make myself! Oh, looks great! I love brussels sprouts! Thank you for the recipe and happy Thangsgiving! This looks and sounds really good, Holly! I've never had Brussels Sprouts OR kale. Crazy right? I will have to give this a try! 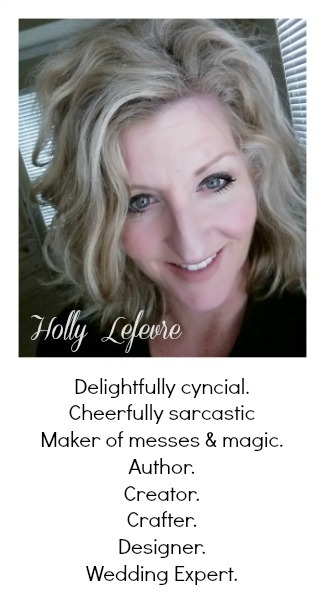 Holly, this looks awesome and all it's goodness for your is so inspiring to make it! This salad -- one of the many reasons I feel very blessed to live in the same neighborhood with you, my friend! What a cool salad... I would never have thought of that combo of ingredients. Wishing you and your darling family a delicious Thanksgiving! That looks so good! 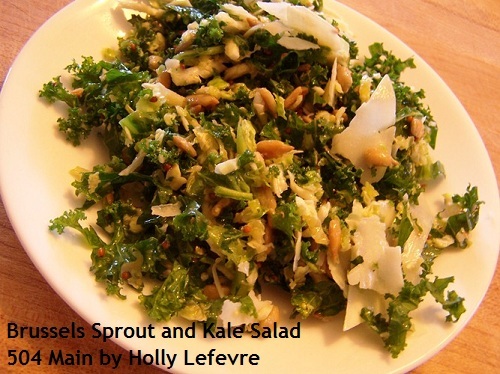 I eat kale & brussels sprouts all the time - can't wait to make this! That sounds delicious! I can't wait to try it. Kale and Brussels Sprouts are among my favorites. Cannot wait to try this out!